The Market Theatre, which is celebrating its 40th year of storytelling, has gone back in time to re-stage its 1997 production of ‘Ubu and the Truth Commission’. The production is directed by the renowned artist William Kentridge, who also conceived the animation, which is an integral part of the play. The script is by Jane Taylor and an interesting facet of this work is that the two original players, Dawid Minaar and Busi Zokufa, have slipped back into the characters they played 19 years ago – and their performances still sting like nettles. 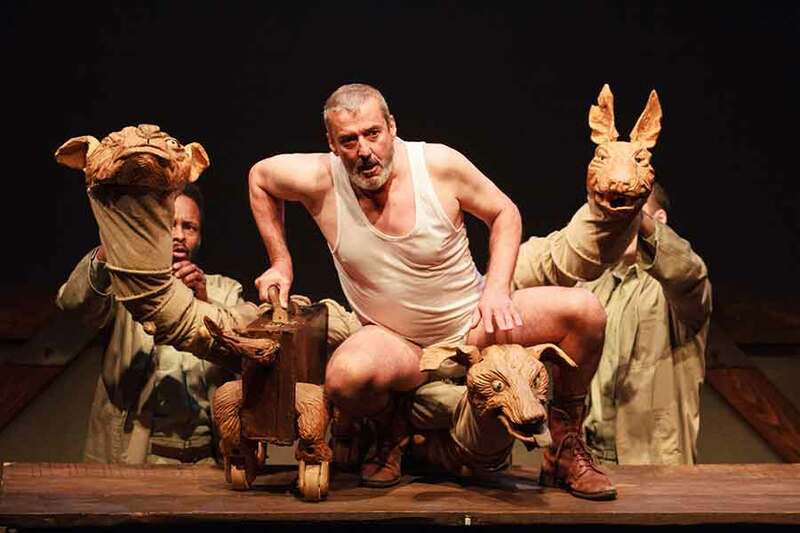 The play is an unsettling mix with life-like and often scary puppets created by the famous Handspring Puppet Company (of ‘War Horse’ fame) serving as real characters and Kentridge’s disturbing animation recalling the bad times of apartheid. Documentary footage drawn from the historical archives of South Africa’s Truth and Reconciliation Commission and music add immeasurably to the impact. Some might argue about dwelling again on the ills of apartheid and not moving on, but ‘Ubu and the Truth Commission’ cleverly uses apartheid as the framework to launch its satirical punch and illustrate in no uncertain terms how it affected ordinary people and disrupted their lives, often with tragic consequences. Minaar, strutting the stage in the bare necessities of a white vest and underpants and velskoen-type boots, is a commanding presence throughout as his character, Pa Ubu, comes to represent the various instruments of apartheid violence, such as the police, the assassins, the spies and the politicians. He is plunged into nightmares of an era, vocalising his thoughts in loud, sharp bursts. He struts, then squirms and wriggles his way around the stage in his depictions, spewing dialogue meant to examine and explain the complexities of apartheid and the atrocities committed by all sides of the regime. His well-endowed wife, Ma Ubu, played by Busi Zokufa, is the penetrating voice (not often clearly articulated though) that bombards him at every turn. The drama centres on this metaphorical tale of marital betrayal in which she has misinterpreted Pa’s nocturnal absence from the marital bed and berates him for his actions. The setting is minimalist. An ominous wooden vulture is perched on the side of the stage, a puppet that gives vent with an eerie screech from time to time. Various puppet characters (expertly manipulated by puppeteers Mongi Mthombeni, Mandiseli Maseti and Gabriel Marchand) represent those testifying at the Commission as human interpreters in a glass booth convey their horrific tales. ‘Ubu and the Truth Commission’, remains a challenging and thought-provoking theatrical exercise with its dark sardonic wit, its detailed puppetry and vivid animation. In 2016 it needs to be seen by a new generation of theatre-goers who will marvel at the collaboration between strikingly different theatrical elements, all seamlessly blended into a brilliantly cohesive whole. * For bookings, visit http://online.computicket.com/web/event/ubu_and_the_truth_commission/1041631483.